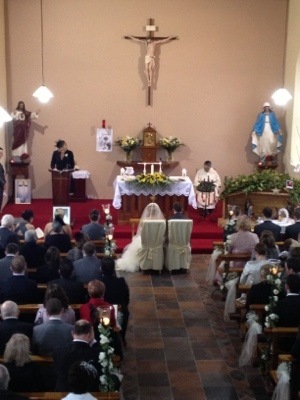 Aimee and David married today in Bohermore church. A very moving moment as their son came up the aisle first, to Scarlet duo playing Pachelbels Canon. David swooped him up and hugged him and couldn’t look down the aisle at Aimee for being so moved. In the homily Priest Lorcan talked about shoplifting. He was shopping in Limerick and saw many people shoplifting. Then he spotted a 7/8 yr old looking hungry, with matted hair, and about to steal. A security man was watching. 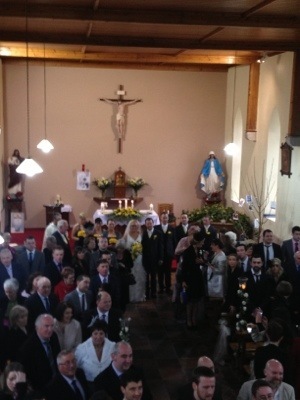 So the priest called to her loudly ” here you go, here’s your bag, here’s the receipt , here’s 5 euro.” She looked in the bag and said ” thank you sir” and went out. His point was when she went, he couldn’t stop her doing it again but at least he could stop her doing it in that moment. Life is made up of all these small moments he said…. Gold- positive people around ( people are drains or radiators as his plumber said) Gold is the moment walking down the aisle. Healing – Life hurts but you aim to have enough gold moments together to help you through. Frankincense – the god moment- one little prayer a day as a family. The stunning moment at the end was about 20 guitars held as a tunnel for them to walk through our the door. Couldn’t take a photo as we were playing hornpipe by Handel.